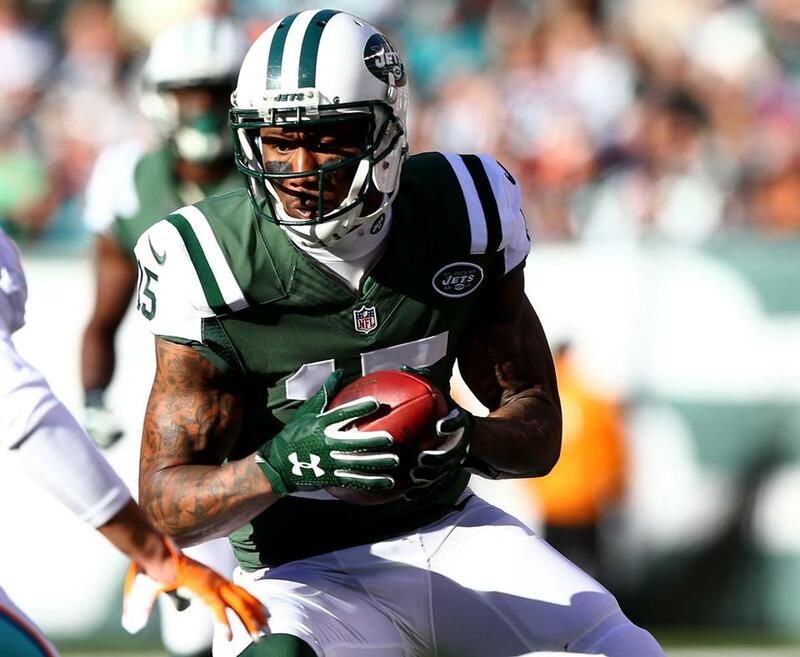 Jets wide receiver Brandon Marshall needs 69 yards to reach 1,000 receiving yards for the eighth time in nine seasons. 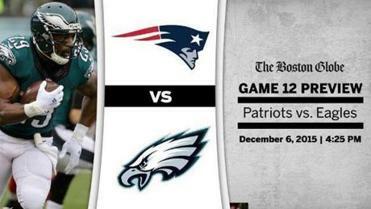 Time: Sunday, 1 p.m., CBS. Line: Jets by 2½. Records: Jets 6-5 (6-5 vs. spread), Giants 5-6 (6-4-1 vs. spread). Key injuries: NY JETS: OUT: CB Darrelle Revis (concussion), DOUBTFUL: S Dion Bailey (ankle), CB Marcus Williams (knee), QUESTIONABLE: LB Calvin Pace (abdomen). NY GIANTS: OUT: TE Larry Donnell (neck), LB Devon Kennard (hamstring, foot), S Brandon Meriweather (knee), QUESTIONABLE: T Marshall Newhouse (back), C Weston Richburg (ankle). Notes: Giants have won last five regular-season meetings for braggin’ rights of New York . . . Jets QB Ryan Fitzpatrick has at least two touchdown passes in eight games, comes off throwing four against Miami . . . RB Chris Ivory leads AFC with 766 yards rushing . . . WR Brandon Marshall needs 69 yards to reach 1,000 receiving for eighth time in nine seasons . . . WR Eric Decker has caught eight touchdowns . . . Sheldon Richardson has 3 1/2 sacks and two forced fumbles, while fellow DE Muhammad Wilkerson has seven sacks and forced fumble . . . ... Jets allowed 12 yards rushing to Miami last weekend, setting franchise mark for fewest given up on ground. New York has allowed 84.4 yards rushing per game, best in league, while holding opponents to under 100 yards six times . . . Jets converted TDs on all four red-zone possessions vs. Dolphins and lead league in red-zone TD efficiency at 73 percent . . . Giants QB Eli Manning has 3,021 yards passing, his 11th consecutive 3,000-yard season . . . WR Odell Beckham Jr. has 30 catches for 481 yards and five touchdowns in his last four games, gaining at least 100 yards in each . . . Three rushing touchdowns through 11 games are Giants’ lowest total since two in 1996 . . . WR-KR Dwayne Harris has two touchdowns in his last two games at home and is No. 2 in league on kickoff returns with 30.4-yard average . . . Twelve sacks are Giants’ lowest 11-game total since sacks were first tracked in 1963; sacks became official stat in 1982 . . . DE Jason Pierre-Paul still looking for his first sack . . . Rookie S Landon Collins leads team with 69 tackles . . . Fantasy Tip: In 11 career home games, Beckham has 81 catches for 1,252 yards and 11 touchdowns. Time: Sunday, 1 p.m. Line: Titans by 2. Records: Jaguars 4-7 (5-6 vs. spread), Titans 2-9 (4-6-1 vs. spread). Key injuries: JACKSONVILLE: OUT: RB Toby Gerhart (groin), WR Allen Hurns (concussion, foot, thigh), LB Dan Skuta (groin), QUESTIONABLE: RB Bernard Pierce (calf), WR Neal Sterling (illness), WR Bryan Walters (back). TENNESSEE: OUT: DT Mike Martin (knee), RB Dexter McCluster (knee), QUESTIONABLE: CB Marqueston Huff (hamstring), LB Derrick Morgan (shoulder). Notes: Jaguars and Titans have split season series past six seasons . . . Jaguars QB Blake Bortles has 22 TDs, needs two to pass David Garrard (23 in 2010) for franchise single-season record . . . Bortles has thrown for 1,956 yards with 16 TDs and 10 interceptions in past seven games. Bortles has two TD passes in six of past seven games . . . Bortles leads QBs averaging 7.1 yards per rush since entering NFL in 2014 . . . Jaguars RB T.J. Yeldon leads AFC rookies and is third in NFL among rookies with 621 yards rushing . . . Jaguars TE Julius Thomas had season-high with nine catches and 116 yards receiving last week. .. Jaguars CB Aaron Colvin leads NFL DBs with four sacks . . . Titans have lost 11 straight at home . . . Titans QB Marcus Mariota leads NFL rookies with 92.8 passer rating and has franchise rookie record 16 TDs . . . Mariota has thrown two or more TD passes in five of nine games . . . Mariota has three games with three or more TD passes, second only to Peyton Manning (four in 1998) among NFL rookies . . . Titans RB Antonio Andrews has 80 or more yards from scrimmage in three of past five games . . . Fantasy Tip: Titans WR Kendall Wright missed last game between teams Nov. 19, but had had four catches for 73 yards in previous game against Jaguars. Falcons wide receiver Julio Jones leads the NFL with 94 catches for 1,245 yards. Time: Sunday, 1 p.m. Line: Buccaneers by 1. Records: Falcons 6-5 (4-7 vs. spread), Buccaneers 5-6 (6-5 vs. spread). Key injuries: ATLANTA: OUT: K Matt Bryant (right quadriceps), TE Tony Moeaki (hamstring). TAMPA BAY: OUT: DE George Johnson (calf), DE Jacquies Smith (hamstring), DOUBTFUL: LB Bruce Carter (concussion), DT Gerald McCoy (hand), QUESTIONABLE: T Gosder Cherilus (knee), TE Luke Stocker (back). Notes: Buccaneers going for first season sweep of NFC South rival since 2007. Falcons won both meetings a year ago by a combined score of 83-77 . . . Falcons are currently seventh in the NFC playoffs standings, just behind Seattle — also 6-5 — for final wild-card spot. Bucs are tied for eighth, trailing Seahawks by one game . . . Bucs have turned season around during stretch in which they’ve won three of five. Falcons have lost four straight, five of six overall, following a 5-0 start . . . Falcons QB Matt Ryan has won 10 of 15 careers starts vs. Bucs. He’s completed 78 percent of his passes for 902 yards, six touchdowns and one interception in past three meetings . . . 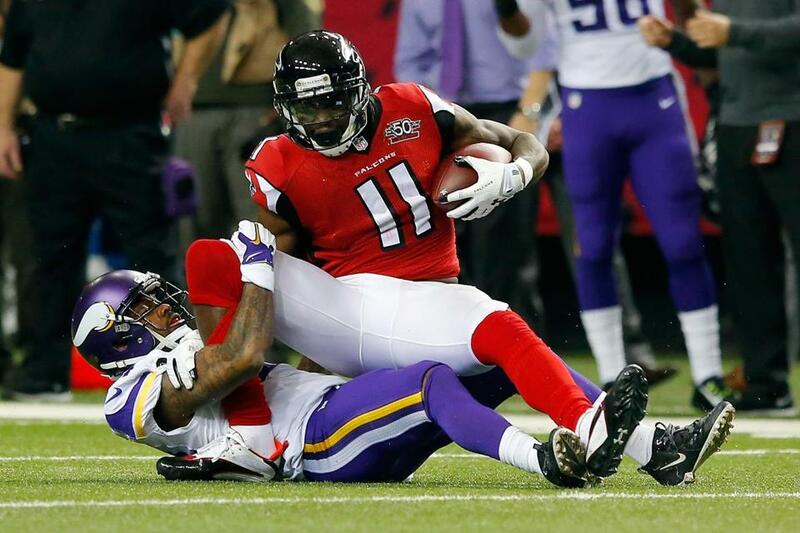 Falcons WR Julio Jones leads NFL with 94 catches for 1,245 yards. Has averaged 147.3 yards per game and scored three TDs in last three vs. Bucs . . . Bucs rookie QB Jameis Winston was named NFL offensive rookie of the month for November, completing 95 of 169 for 1,179 yards, seven TDs and three interceptions. He also rushed for three TDs, while leading Bucs to 3-2 record . . . Bucs RB Doug Martin is second in the league in rushing behind Adrian Peterson with 1,038 yards . . . Bucs rookie LB Kwon Alexander had 11 tackles and an interception while also recovering a fumble and forcing another during Nov. 1 victory over Falcons. Time: Sunday, 1 p.m. Line: Bengals by 9. Records: Bengals 9-2 (9-1-1 vs. spread), Browns 2-9 (4-7 vs. spread). Key injuries: CINCINNATI: DOUBTFUL: TE Tyler Eifert (neck), CB Chris Lewis-Harris (ribs), QUESTIONABLE: CB Leon Hall (back), S George Iloka (groin), CB Adam Jones (foot). CLEVELAND: OUT: WR Taylor Gabriel (concussion), CB Justin Gilbert (concussion), CB Joe Haden (concussion), WR Andrew Hawkins (concussion), QUESTIONABLE: T Joel Bitonio (ankle), LB Nate Orchard (groin), DT Randy Starks (knee). Notes: Ohio’s NFL teams are on opposite sides of state and standings . . . Bengals trying to improve to 10-2 for second time in club history. They went 10-2 in 1975 and finished 11-3 . . . Bengals closing in on fifth straight playoff appearance . . . Bengals are 16-6 in last 22 meetings with Browns and 17-8 vs. Cleveland under coach Marvin Lewis . . . Cincinnati defense ranked first in scoring at 17.5 points per game. Bengals have never led league in that category for full season . . . Bengals QB Andy Dalton completed 21 of 27 passes for 234 yards and 3 TDs in win over Browns last month . . . With win, Dalton would have most road wins (23) by QB in first five seasons since 1970 . . . TE Tyler Eifert leads league with 12 touchdown catches . . . Bengals blanked Browns 30-0 on visit to Cleveland last season . . . Browns coming off heart-breaking loss Monday night to Baltimore. Ravens blocked FG try and returned it for TD on game’s final play . . . Browns have lost six straight and are 2-14 since 7-4 start last season . . . Browns starting QB Josh McCown sustained season-ending collarbone break against Ravens . . . Austin Davis will be 24th QB to start game for Browns since 1999 . . . Davis came off bench Monday night and threw game-tying TD pass . . . Browns TE Gary Barnidge leads team with 55 catches — 11 more than his career total entering season . . . Browns gave up 2 TDs on special teams vs. Ravens, allowing 82-yard punt return and field-goal block/runback . . . Browns have been ravaged by injuries, especially concussions. Pro Bowl CB Joe Haden has had two this season and expected to miss sixth game . . . Fantasy Tip: WR A.J. Green could have a field day against an injury-depleted Browns secondary still missing CB Joe Haden (concussion). 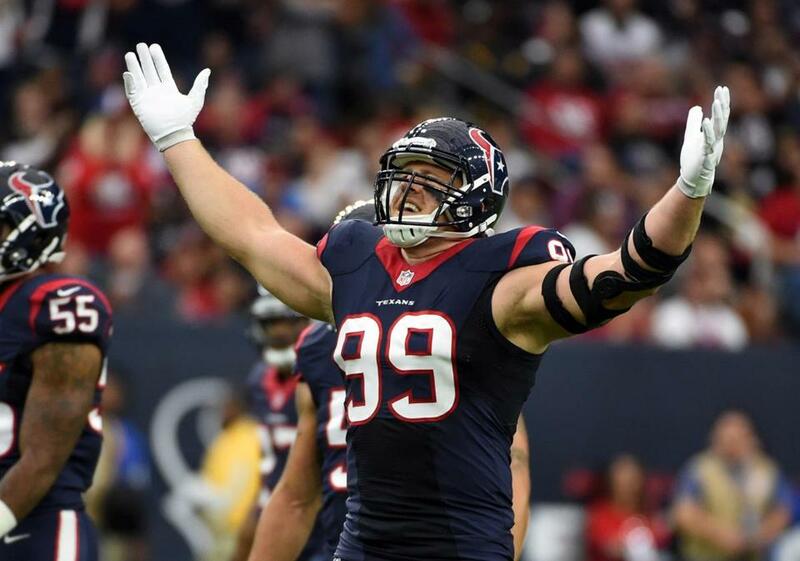 Texans defensive end J.J. Watt needs 1½ sacks to reach 15 for the third time in five seasons. Time: Sunday, 1 p.m. Line: Bills by 3. Records: Texans 6-5 (6-5 vs. spread), Bills 5-6 (4-5-2 vs. spread). Key injuries: BUFFALO: OUT: LB Nigel Bradham (ankle), G John Miller (ankle), RB Karlos Williams (shoulder), DOUBTFUL: T Seantrel Henderson (illness). Notes: Texans have won past three meetings, including last year when DE J.J. Watt intercepted EJ Manuel’s pass and returned it 80 yards for touchdown to put Houston ahead for good on Buffalo’s second-half opening drive . . . Texans have won four straight, best streak since winning six in row from Oct. 21-Nov. 22, 2012 . . . After allowing 199 points through first seven games, defense has allowed 35 in past four . . . Since allowing season-high five TDs in 44-26 loss to Miami on Oct. 25, defense has given up two TDs in past four . . . With 1,081 yards receiving, WR DeAndre Hopkins is 129 short of matching career high set last season. Needs 418 to establish franchise single-season record set by Andre Johnson in 2012 . . . Watt needs 1 1/2 sacks to reach 15 for third time in five seasons . . . CB Johnathan Joseph has 12 interceptions, one short of matching Dunta Robinson’s career franchise record . . . Hopkins and Buffalo’s Sammy Watkins were formidable receiving tandem during 2011 and ‘12 seasons at Clemson . . . Bills RB LeSean McCoy plays 100th career game, and has topped 100 yards from scrimmage in past five . . . QB Tyrod Taylor has six TDs passing and one rushing with no interceptions and one lost fumble in past five starts . . . Bills are 0-6 in games QB has 30 or more pass attempts . . . Watkins had six catches for 158 yards — 10 short of matching single-game high — and two TDs in first half against Kansas City, but held to no catches on one target in second half . . . Bills’ 16 sacks are 30 off last season’s total through 11 games. And they’re 1-4 in games in which they have fewer than two sacks . . . Fantasy Tip: Hopkins is solid start after Bills’ inability to generate pass rush against Kansas City led to WR Jeremy Maclin catching nine passes for 160 yards and touchdown. Time: Sunday, 1 p.m. Line: Bears by 7. Records: 49ers 3-8 (5-6 vs. spread), Bears 5-6 (5-5-1 vs. spread). Key injuries: SAN FRANCISCO: OUT: TE Garrett Celek (ankle), RB Carlos Hyde (foot). CHICAGO: OUT: WR Marquess Wilson (foot), QUESTIONABLE: TE Zach Miller (rib), S Antrel Rolle (knee), WR Eddie Royal (knee). Notes: San Francisco is 0-5 on road . . . QB Blaine Gabbert passed for career-high 318 yards last week . . . WR Anquan Boldin, with 984 receptions, closing in on 1,000. Only 10 players have caught 1,000 or more passes . . . LB Aaron Lynch leads team with 6 1/2 sacks . . . CBs Kenneth Acker and Tramaine Brock tied for team lead with three interceptions . . . K Phil Dawson is 18 of 19 on field goals . . . Bears offensive coordinator Adam Gase and defensive coordinator Vic Fangio interviewed for 49ers’ head coaching job in offseason. Jim Tomsula ultimately got promoted from defensive line coach to replace Jim Harbaugh. Gase wound up following coach John Fox from Denver to Chicago. Fangio got hired by Bears after coordinating defense in San Francisco that ranked among league’s best past four years . . . Four of Chicago’s five remaining games are against teams with losing records: San Francisco (3-8), Washington (5-6), Tampa Bay (5-6), Detroit (4-7). Exception is game at Minnesota (8-3) on Dec. 20 . . . RB Jeremy Langford tied for lead among NFL rookies with six rushing touchdowns . . . Martellus Bennett leads NFL TEs with 140 catches since 2014 . . . TE Zach Miller has career-high four TD catches . . . Fantasy Tip: With 259 yards from scrimmage over past three games, 49ers RB Shaun Draughn could be good pick facing defense that has struggled against run. Time: Sunday, 1 p.m. Line: Dolphins by 3½. Records: Ravens 4-7 (3-7-1 vs. spread), Dolphins 4-7 (4-7 vs. spread). Key injuries: BALTIMORE: OUT: TE Maxx Williams (concussion), DOUBTFUL: WR Marlon Brown (back), T Eugene Monroe (shoulder). MIAMI: OUT: T Ja’Wuan James (toe), WR Rishard Matthews (ribs), DT Earl Mitchell (calf), QUESTIONABLE: C Mike Pouncey (foot), WR Kenny Stills (ankle). Notes: Ravens coach John Harbaugh is 5-0 against Dolphins . . . Ravens have sacked Ryan Tannehill 12 times in two games . . . Baltimore’s seven losses have been by a total of 32 points . . . Ravens rank second-worst in NFL with minus-10 turnover differential. They’re tied for last in NFL with four interceptions . . . Ravens are giving up sacks at lowest rate in NFL and have allowed only 16 . . . If Baltimore’s Justin Tucker scores four points Sunday to reach 500 in his career, he’ll reach milestone in his 60th game, faster than any kicker in NFL history. .. Baltimore punter Sam Koch leads NFL with 44.3 net average . . . Dolphins have trailed by double figures in each of past five games . . . Miami throws 67 percent of the time, highest rate in league . . . Dolphins rank second-worst in NFL in third-down conversions at 28 percent. They’re even worse on fourth down — 27 percent (4 for 15) . . . Fantasy Tip: Dolphins rookie WR DeVante Parker, slow to recover from offseason foot surgery, saw his most extensive action last week and scored first NFL TD. With WR Rishard Matthews nursing ribs injury, Parker might be poised for breakout game. Vikings cornerback Terence Newman has three interceptions in the last three weeks. Time: Sunday, 1 p.m., Fox. Line: Seahawks by 2. Records: Seahawks 6-5 (4-6-1 vs. spread), Vikings 8-3 (9-2 vs. spread). Key injuries: SEATTLE: OUT: DE Demarcus Dobbs (concussion), DT Jordan Hill (toe), RB Marshawn Lynch (abdomen), WR Paul Richardson (hamstring), QUESTIONABLE: CB Marcus Burley (ankle), RB Will Tukuafu (concussion). MINNESOTA: OUT: DT Linval Joseph (foot), S Andrew Sendejo (knee), QUESTIONABLE: LB Anthony Barr (hand, groin), S Harrison Smith (knee). Notes: Seahawks coach Pete Carroll was Vikings DB coach from 1985-89. Seahawks offensive coordinator Darrell Bevell held same job with Vikings from 2006-10 . . . Vikings TE Rhett Ellison, DE Everson Griffen and LT Matt Kalil all played at USC under Carroll . . . Seahawks trail Arizona by three games in NFC West with five to play. They’ve scored 100 points over last three games . . . Seahawks QB Russell Wilson has won both previous starts vs. Vikings, with five TDs and no interceptions for 139.2 passer rating . . . Seahawks rookie RB Thomas Rawls leads NFL with average of 5.6 yards per rush, replacing injured starter Marshawn Lynch . . . Seahawks DE Cliff Avril has seven sacks and three forced fumbles in last eight games vs. Vikings . . . With one game lead over Green Bay, Vikings are chasing first NFC North title since 2009, the last time the Seahawks visited. They have three of next four games at home . 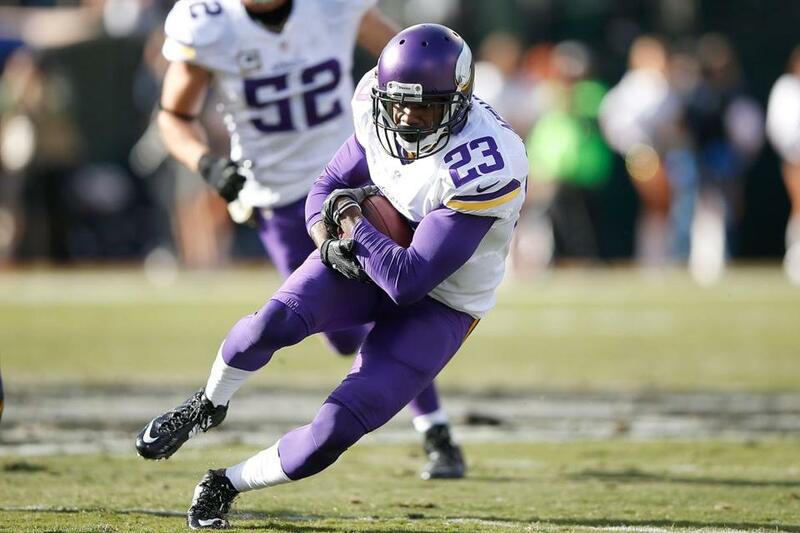 . . Vikings RB Adrian Peterson, who leads league in rushing, has 18 career games of 150-plus yards. That’s a three-way tie for fourth-most in history, trailing Barry Sanders (25). Everyone ahead of and tied with Peterson on the list is in Pro Football Hall of Fame . . . Half of Vikings’ eight interceptions this season have come in last three weeks, including three by Terence Newman . . . At 9-4, Vikings have highest home winning percentage in NFL history by team playing in temporary stadium . . . Fantasy tips: Vikings TE Kyle Rudolph has worked way back into starting consideration. He has 13 catches for 159 yards and a TD over past two games . . . Seahawks WR Doug Baldwin has 339 yards and four TDs over last three games. Time: Sunday, 1 p.m. Line: Cardinals by 4. Records: Cardinals 9-2 (6-4-1 vs. spread), Rams 4-7 (4-7 vs. spread). Key injuries: ARIZONA: OUT: RB Andre Ellington (toe), CB Jerraud Powers (calf), DOUBTFUL: DE Cory Redding (ankle), QUESTIONABLE: WR Michael Floyd (hamstring). ST. LOUIS: OUT: CB Trumaine Johnson (thigh), DOUBTFUL: T Andrew Donnal (knee), DE Robert Quinn (back), K Greg Zuerlein (hip), QUESTIONABLE: QB Case Keenum (concussion). Notes: Cardinals have won six of seven since losing at home to Rams in Week 4 and have five-game winning streak. They’ve won nine of their first 11 in consecutive seasons for the first time in franchise history and lead the NFC West by three games . . . Rams have lost four straight after entering November with a winning record for the first time since 2006, but are 3-0 vs. NFC West with home victories over Seahawks and 49ers . . . Cardinals S Tyrann Mathieu had a career-high 13 tackles last week and in four games vs. NFC West opponents has four interceptions, one returned for TD, eight passes defensed and a forced fumble . . . QB Carson Palmer is second in NFL in TD passes (27) and passer rating (105.9), trailing only the Patriots’ Tom Brady in both categories . . . WR Larry Fitzgerald has 16 TD receptions against Rams, most among active players in NFL against single team in regular season, and needs 8 yards receiving for seventh 1,000-yard season of career . . . Rams have averaged 10 points the last three games of the four-game skid . . . RB Todd Gurley had 146 yards rushing against Cardinals in first career start, but held to 19 yards on nine attempts last week . . . WR Tavon Austin had two TD receptions against Cardinals in October . . . Fantasy Tip: Palmer has led game-deciding scoring drives in each of the last three games. He’s three TD passes shy of the franchise record set by Kurt Warner in 2008. 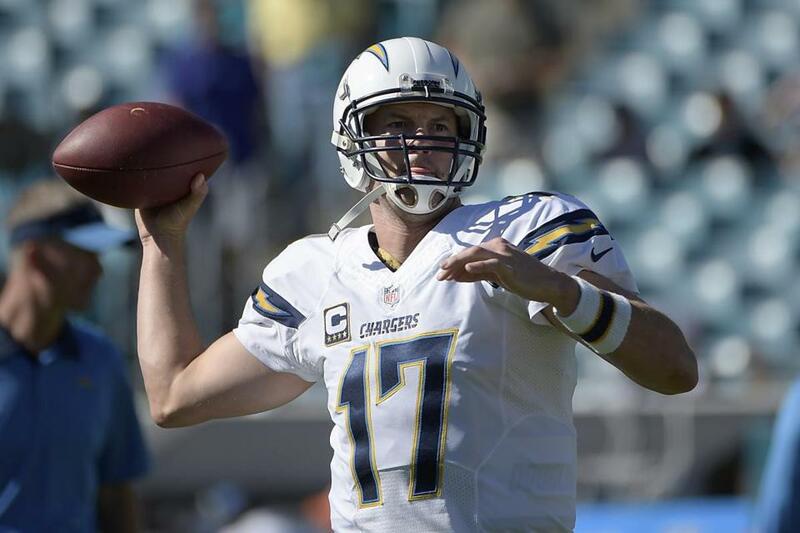 Chargers quarterback Philip Rivers crossed the 40,000-yard milestone in a win at Jacksonville. Time: Sunday, 4:05 p.m. Line: Broncos by 3½. Records: Broncos 9-2 (7-4 vs. spread), Chargers 3-8 (4-7 vs. spread). Key injuries: DENVER: OUT: QB Peyton Manning (foot), S T.J. Ward (ankle), LB DeMarcus Ware (back), NT Sylvester Williams (ankle), QUESTIONABLE: WR Bennie Fowler (ankle), G Louis Vasquez (groin). SAN DIEGO: OUT: T King Dunlap (ankle), T D.J. Fluker (concussion), QUESTIONABLE: DT Corey Liuget (foot). Notes: Broncos have won three straight against Chargers, including in playoffs in 2013 season, and six of seven . . . With Peyton Manning injured, Brock Osweiler is first Broncos QB to win his first two NFL starts since John Elway in 1983. Osweiler is 10th QB to win his first two starts with the Broncos. Kyle Orton (2009), Craig Morton (1977) hold team record with six straight wins at start of their Broncos career . . . Denver coming off OT win against Tom Brady, previously undefeated Patriots . . . Broncos RB Ronnie Hillman played for San Diego State, which hosts Air Force in Mountain West Conference championship game Saturday . . . This could be second-to-last NFL game in San Diego. Chargers chairman Dean Spanos wants to move team to industrial suburb of Los Angeles . . . Game comes four days after NFL Commissioner Roger Goodell said time has pretty much run out for San Diego. Goodell said San Diego, Oakland, St. Louis must have viable stadium plans by Dec. 28. NFL owners expected to vote on L.A. relocation in January . . . Chargers walked away from negotiations with city, county for new stadium in mid-June . . . Chargers coach Mike McCoy is 1-4 against Denver, where he was on staff from 2009-2012 . . . San Diego RB Melvin Gordon, team’s first-round draft pick, still looking for first NFL TD . . . Philip Rivers reached 40,000-yard milestone in win at Jacksonville, in fourth-fewest games in league history, 159 . . . Rivers has thrown 76 TD passes to Antonio Gates, the most from a QB to TE in NFL history. Fantasy Tip: Rivers matched career-high with four TD passes vs Jacksonville, threw for 300 yards for seventh time this season. Time: Sunday, 4:05 p.m. Line: Chiefs by 3. Records: Chiefs 6-5 (6-5 vs. spread), Raiders 5-6 (6-5 vs. spread). Key injuries: KANSAS CITY: OUT: S Husain Abdullah (neck), LB Justin Houston (knee), C Mitch Morse (concussion), WR De’Anthony Thomas (concussion), QUESTIONABLE: G Jeff Allen (ankle), DE Allen Bailey (calf). OAKLAND: OUT: LB Neiron Ball (knee), CB Keith McGill (ankle), DOUBTFUL: C Rodney Hudson (ankle), RB Taiwan Jones (knee), QUESTIONABLE: CB Neiko Thorpe (knee). Notes: Chiefs won three of past four meetings, with loss coming last year in Oakland . . . Kansas City is third team in NFL history with at least five straight games in one season with no turnovers. New England holds record with seven in 2010 . . . Chiefs QB Alex Smith has 283 straight passes without INT, fourth-longest streak ever . . . Smith is highest-rated passer ever vs. Raiders with 108.8 rating in five starts . . . Kansas City RB Charcandrick West averaging 119 yards from scrimmage per game over his last four contests . . . Oakland QB Derek Carr has thrown for at least 300 yards in four of past five games and six overall this season. Carr needs one more 300-yard game to tie Rich Gannon’s single-season franchise record . . . Raiders RB Latavius Murray has 171 yards, two TDs on 16 carries in two games vs. Chiefs . . . Oakland’s Khalil Mack has seven sacks in past nine games . . . Raiders have allowed 14 sacks, tied for fewest in NFL . . . Oakland CB David Amerson had six passes defensed last week and is tied for league lead with 19 this season . . . Fantasy Tip: TE Travis Kelce leads Chiefs with four TD catches, including three on team-high nine red zone targets. Raiders have allowed 11 TD catches in 11 games to opposing tight ends. Panthers running back Jonathan Stewart’s 832 yards rushing ranks third in the NFL. Time: Sunday, 4:25 p.m. Line: Panthers by 6½. Records: Panthers 11-0 (9-2 vs. spread), Saints 4-7 (4-6-1 vs. spread). Key injuries: CAROLINA: OUT: DE Mario Addison (ankle), CB Charles Tillman (knee). NEW ORLEANS: OUT: DT John Jenkins (concussion), DOUBTFUL: WR Willie Snead (calf), QUESTIONABLE: T Terron Armstead (knee), G Jahri Evans (ankle). Notes: Carolina’s 15-game regular season winning streak began in New Orleans last season . . . Panthers are 5-0 on the road this season . . . Panthers have won five of last seven vs. Saints . 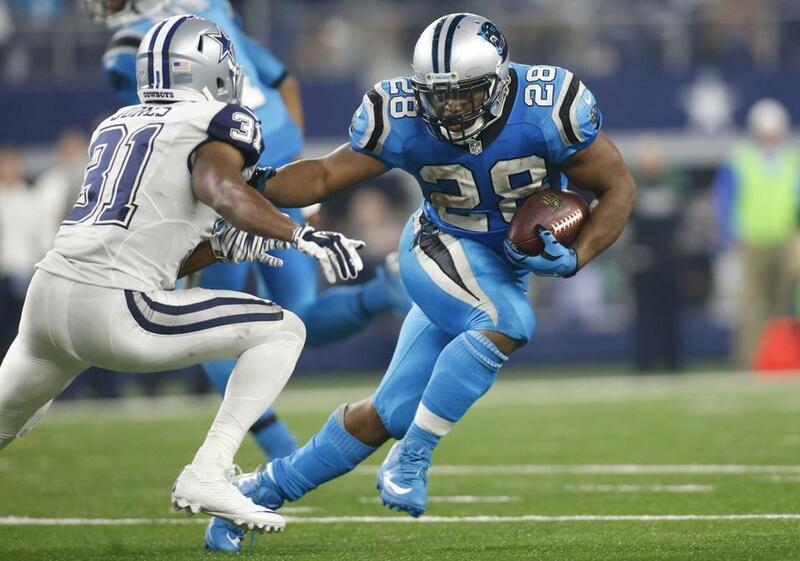 . . Panthers RB Jonathan Stewart’s 832 yards rushing ranks third in NFL . . . Panthers S Kurt Coleman leads NFC with 5 INTS, has INT in four of past five, including INT-TD last week . . . QB Cam Newton has passing and rushing TD in each of last two meetings with Saints, both Panthers victories . . . TE Greg Olsen had eight catches for 134 yards and two TDs in last meeting . . . DE Kony Ealy has sack in five straight . . . LB Luke Kuechly leads NFL with 548 tackles. Had two INTs last week, one for TD . . . Kuechly has most INTs by NFL LB since 2012 with 10 . . . Saints are on three-game losing streak but are 3-2 at home this season . . . Saints coach Sean Payton is 8-9 vs. Panthers . . . QB Drew Brees has TD pass in 51 straight at home . . . Brees had streak of overall games with TD pass snapped at 45 last week . . . RB Mark Ingram has 1,095 yards, his second straight season eclipsing 1,000-yard mark . . . TE Ben Watson has 24 catches, 334 yards, two TDs in past three at home . . . S Jairus Byrd had first INT with Saints last week . . . DE Cameron Jordan has 15 sacks in past 20 at home . . . Jordan has six sacks, forced fumble and fumble recovery in past six games. Time: Sunday, 8:30 p.m., NBC. Line: Steelers by 7½. Records: Colts 6-5 (7-4 vs. spread), Steelers 6-5 (5-5-1 vs. spread). Key injuries: INDIANAPOLIS: OUT: T Anthony Castonzo (knee), WR Phillip Dorsett (ankle), LB Jerrell Freeman (hamstring), QB Andrew Luck (abdomen, kidney), G Hugh Thornton (elbow), QUESTIONABLE: C Khaled Holmes (fibula). PITTSBURGH: OUT: LB Sean Spence (hamstring), QUESTIONABLE: TE Heath Miller (rib). Notes: The Colts have won three straight, the last two with 40-year-old backup QB Matt Hasselbeck. He is 4-0 while filling in for injured Andrew Luck this season. No quarterback in league history has won five straight starts at age 40 or older . . . The Steelers have won three of the last four meeting with Indianapolis, including a 51-34 rout last October when Ben Roethlisberger set a franchise record with 522 yards passing and six touchdowns . . . The Colts are 30th in the NFL in yards per play (5.08) while Pittsburgh is first (6.41) . . . Indianapolis WR Andre Johnson needs 13 yards receiving to pass Steve Smith for 10th on the all-time list . . . Colts kicker Adam Vinatieri has made 16 of 17 field goals against Pittsburgh . . . Indianapolis RB Frank Gore is the NFL’s active leader in career yards rushing (11,730) . . . Roethlisberger went over 400 yards for the eighth time in his career last week against Seattle, throwing for 456 yards in the loss . . . Pittsburgh WR Markus Wheaton set a career high with 201 yards receiving versus Seattle . . . The Steelers are eighth in the league in rushing but have just 119 yards rushing in their last two games . . . Pittsburgh LB Bud Dupree’s four sacks are tied for the most by a rookie . . . Pittsburgh has allowed 300 or more yards passing in each of its last four games . . . Fantasy: Pittsburgh WR Antonio Brown is averaging 9.75 receptions for 130 yards in his last four games. Time: Monday, 8:30 p.m., ESPN. Line: Redskins by 4. Records: Cowboys 3-8 (3-8 vs. spread), Redskins 5-6 (5-6 vs. spread). Key injuries: DALLAS: OUT: QB Tony Romo (shoulder). WASHINGTON: OUT: LB Perry Riley Jr. (foot). DNP: TE Derek Carrier (ankle, Achilles), WR Andre Roberts (knee), S Trenton Robinson (hamstring). Notes: 17th Monday night meeting between Dallas and Washington, tied with Denver vs. Oakland for most meetings between two opponents on a Monday . . . Redskins enter tied with New York Giants for first place in NFC East . . . Cowboys haven’t won a game this season without QB Tony Romo, who is sidelined with a broken collarbone . . . QB Matt Cassel starts in Romo’s place . . . Cowboys WR Dez Bryant has 4 TDs in past three games against Redskins. He leads NFL with 43 TD catches since 2012 . . . Jason Witten needs two catches to become second TE in NFL history with 1,000 catches. Also ranks second in yards receiving at the position (11,010) . . . Cowboys defense has intercepted six passes this season; only four teams have fewer . . . The Redskins have won their past five home games, part of a 5-1 home record this season, vs. 0-5 on the road . . . During that home streak, QB Kirk Cousins has thrown for 10 TDs and zero INTs, with a 121.2 passer rating, and run for 3 TDs . . . When Cousins is picked off at least once, Washington is 0-6; when he avoids an interception, the team is 5-0 . . . WR DeSean Jackson’s 63-yard TD catch last week was his 19th of at least 60 yards, tied for the fourth-most in NFL history . . . Redskins defense is allowing 126.6 yards rushing per game; only four teams are allowing more. Redskins also giving up 4.7 yards per carry . . . Fantasy tip: Redskins TE Jordan Reed had eight catches for 98 yards last week and has caught five TD passes in the last five games.